Apart from the general rules of the roulette game, there also exist a set of certain unwritten rules of casino etiquette that are unconditionally accepted by both players and casino employees. In fact, many endow the rules of etiquette in the casino with as much importance as the rules of the roulette game itself. That is why it is important that the players get the tips to the rules of casino etiquette along with the general rules of the roulette casino game. First of all, at a table it is important to preserve the atmosphere of politeness and civility. The players are supposed to watch their manners and avoid disturbing other players. It is prohibited to eat or drink at a table. Otherwise you may either disturb other players or spill food or drink on the layout. Some casinos even use fees for spoiling the table layout. No electronic appliances like mobile phones or cameras are allowed at a table, just like any big-size items like begs or wallets. Some casinos may demand that the players are dressed according to the certain dress code. Usually this concerns only elite European casinos, but it is better to check if a casino has dress code beforehand. The game of the roulette consists in predicting the possible winning number and placing your bet accordingly. There are certain rules that define the placement of bets and the whole game process. When the bets have already been placed and the croupier has announced that no more bets can be made, the players cannot touch their chips any more. When the 'dolly' (marker) is put on the winning number, the player who touches his or her chips will be disqualified from the game or even removed from the casino as it will be regarded as cheating. While placing their chips, the players should not throw them to the layout. This way the chips may displace other players' chips. If it is hard for the player to reach the place for the bet, he or she should ask the croupier to make it for them. Thus it will be a call bet. Call bets are in fact viewed as courtesy bets. Only if the croupier has time he or she will place call bets. So that the bet becomes valid, the croupier should repeat it. Otherwise the croupier says "No bet". It is very impolite to argue with the croupier's decisions concerning call bets. All changes for color or cash chips should be made between the spins of the wheel. The players have to change their color chips for cash chips before leaving the table. Otherwise the chips will lose value. In some casinos politeness obliges the players to leave tips for the croupier. 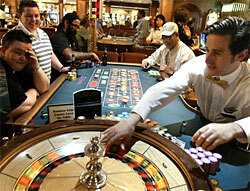 It is most common in American casinos, while most European casinos prohibit their employees to accept tips. The amount of the tip depends on the size of the player's winnings. Following these simple rules together with the general knowledge of the game basics will allow you to always remain a decent social being and enjoy the game together with other players.